R&F Handmade Paints Pigment Sticks are seductively soft oil paints in stick form, providing today's artist with a truly direct way to work. This set is designed to mimic in oils the same effects of traditional conte crayon drawings. Used directly on the canvas, with no brushes required, this set is ideal for figure drawing. Great for beginners and professionals alike. Rich deep pigments create beautiful hues and these sticks can be applied and then painted with paintbrushes if desired. Interesting format allows for interesting application and innovative techniques. R&F Pigment Sticks are our unique version of an oil stick that will transform the way you paint. They are richly pigmented with a lipstick soft consistency that gives them the same fluidity, subtlety and durability of traditional oil colors. They have just enough natural wax added to maintain a solid stick form. Pigment Sticks let you get rid of the brush if you want to, allowing you to work more directly on your surface. Their immediacy and mark making ability afford an endless range of options. R&F Handmade Paints Pigment Sticks are seductively soft oil paints in stick form, providing today's artist with a truly direct way to work. 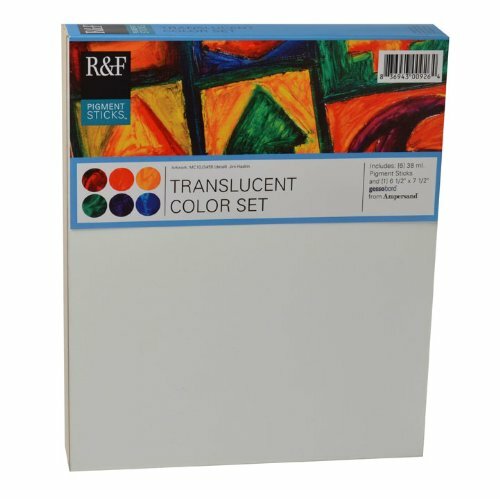 This set is a collection of some of R&F Handmade Paint's most vivid, translucent colors. You will be amazed at the effects you can create with this set of jewel-toned colors. 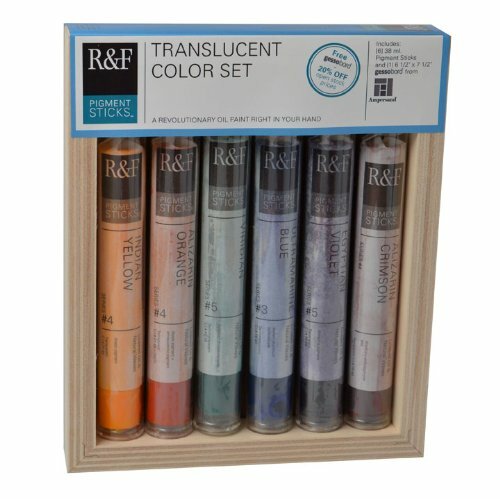 The R&F Handmade Paints Pigment Stick Translucent Set contains 6, 38-ml Pigment Sticks. This set includes Indian Yellow, Alizarin Orange, Alizarin Crimson, Egyptian Violet, Ultramarine Blue and Viridian. Also included is a 6-1/2-inch-by-7-1/2-inch cradled Gessobord by Ampersand. Pigment sticks are a revolutionary oil paint right in your hand. They have a smooth buttery texture and can be used on paper, canvas, board, panels and other surfaces. Just like oil paint in a stick. Includes a cradled Ampersand Gessobord and sticks can be used with paintbrushes once applied to a surface.